Are there Aliens on Ceres? Comet Over Mars or UFO? The origins of the Question Mark is from the shape of the Pleiades star cluster. Occultic symbol for the orion group in new film?! sirian at rotary club again! "In order to grasp the truth, you must use your free will and freedom of thought. Do not let your mind get trapped within the religious or scientific paradigms. Religion and science are simply forms of control that were created by the ruling elite long before you were born. And thus, it is a shame that after being born on this planet, you were raised on either of those two lies. Naturally, since you have been lied to about reality your entire life, any truthful revelations contradicting your false worldview may indeed appear to be far-fetched. But, to make things even worse, human beings are stubborn creatures who let their egos override everything else: Instead of learning about new information that does not fit within your current worldview, you would rather exercise your ego by letting others know what is and is not possible, merely based upon your personal knowledge and feeble understanding of what actually exists. " evidence for this is the god marduk holds a similar symbol to what the ummites represent themselves as. 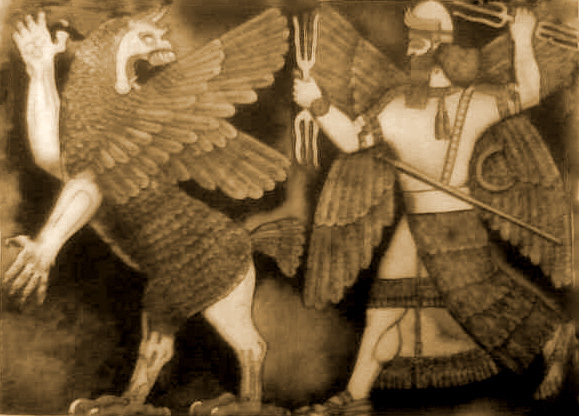 marduk fights the god tiamat in sumerian mythology repressented by a griffon like in the image. marduk is where the roman god mars comes from, the god of war, which is where we get the virgin mary from which there are three of them in the bible each representing a star in Orion's belt which I have talked about in previous posts. unless the ummite symbol doesnt represent the constellation of orion then the person who made this image is wrong about the bahai faith ringstone symbol representing the constellation of orion. then the ummites might not then be apart of the Orion group, the fact that the ummite symbol is similar to bahai faith symbol (ringstone symbol) is not a good sign what so ever and its similar to the layout of the constellation of orion is not good either, bahai faith is linked to the templars and teutonic knights and zionism in Israel from my previous research into the subject, and as you probably know the orion group has been responsible for alot of bad happening here on earth. so overall I have mixed feeling about the ummites. If they are linked to bahai faith , then they could be linked to zionism, if they are linked to zionism, they could be linked to the nazis. All depends on whether the ummite symbol represents the constellation of orion or not!! Terran resistance: "we are borg"
The character 7 of 9 from star trek comes to mind. The number 7 has long been used to symbolism the Pleiades star cluster but not many people know that the number 9 is used but to a lesser extent. For example in freemasonary, where the 7 stars of the pleiades are seen around the moon in masonic art. I have many of them in my back yard and surrounding area. There is both multidimensional, humanoids, reptilians and other species here, They have manifested and grown these reptilians from birth in order for them to be physical in the third dimension. They are aloof, arrogant, and believe with all they are superior and that we are merely food and waiting on the potential to steal our very soul. They are not a gracious, loving, giving or caring people. These reptilians do not care for their young or have loving relationships with other species as we do with out dogs and cats. They do seem to form bonds with each other, to what degree i am unsure. The ones that come from the 5th dimension have many humanoid and animal looking species of slaves which spend an inordinate amount of time preparing their food. they also do various bookkeeping or other activities. Some are sexual playmates for the reptiles, The food they eat consist of two humanoid people per day, alive in their dimension, wrapped in what i would compare to the way we wrap meat in burritos. The humanoids are places horizontally with their heads sticking out each end of the burrito type wrap. They require two humanoids a earth day to sustain themselves.. Many of the humanoids have been eaten multiple times in their dimension and don't consider it any big deal to be eaten again. They fully accept their roles as slaves to the reptilians and usually are of of low moral character and standards. These humanoids are mischievous and above all liars. The love to spy or watch people as they are envious of our freedom and physicality. The Annunaki do not like to communicate with us, as realizing that we are more than food and useless slaves causes them to have to re-evaluate their relationship with us and they are not willing to give us up as a food source. These Annunaki in no means have our best interest at heart and have hundreds of different species as workers and slaves. Rather than using tools as we do, different species of entities do everything for them. These workers/slaves are as diverse as one could imagine and perform everything from hammering to surgical procedures. I personally believe the Annunaki are growing 3rd dimensional reptilians for an army of force to control the populace after some event occurs, such as, a polar shift or comets hitting the earth. They will come out of the shadows when an invasion force arrives from Nibiru within weeks or on the outside months. The entire race cant wait to collect the many souls of humans that will perish in the coming days. They also eagerly await the torment, angst, violence and hatred that will overcome the human race during this most horrific transition, These entities entered my life on December 21, 2012 and now are so emboldened as to casually lie around my back yard at night, They do have machine type devises they use to knock out my security cameras on a regular basis and i have seen higher dimension spacecraft which charged up on out local electricity pole. They have also,. the slave type people not Annunaki, tormented my dogs and caused strange behavior patterns in them, like starring endlessly at blank walls and not minding appropriately. I, as well as my dogs. have to get away from them to restore some resemblance of sanity in my life. I am just trying to ignore them as much as possible, but my curiosity about when the event will occur usually leads me back to our primitive communication techniques. I ask them question and they nod yes or no, but remember they are deceivers with their own agenda and not interested in telling us the truth. while i am able to see them, i am not able to hear them and the humanoid and other various other servant or slave species are absolutely never to be believed.What is frightening is as the three dimensional species continue to mature, where are they procuring their three dimensional food of choice, humans. they prefer children or younger people. The slave people even feed or force in the humanoid burritos and they sometimes eat these as we would eat corn on the cob. Anyway, my regular life calls. If anyone is interested in what i have observed and learned about theses people just ask, i will try to answer you as honestly, objectively and succinctly as possible.